Global demand for cleaner, more compact and efficient energy systems has led to the development of Lean Premixed Gas Turbine (LPGT) Engines. Emissions from these engines contain less unburned fuels, CO, NOx among other pollutants. However, the use of LPGT Engine is hindered by critical thermo-acoustic combustion instabilities which among many problems is detrimental to the engine mechanical integrity. Hence, this research will examine the dynamic response of the premixed fuel experimentally using high speed, high resolution flow visualisation and acoustic measurements. The results from this study will contribute to the elimination of operational instabilities in LPGT engines. Oluwaseun is a PhD researcher and an awardee of the Nigerian Petroleum Technology Development Fund (PTDF) Scholarship. 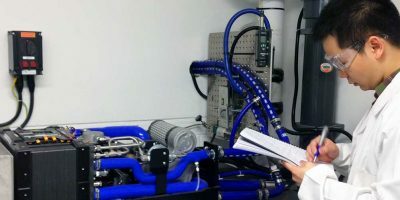 She received her MSc degree in Petroleum Engineering, from Heriot Watt University Edinburgh UK, her MSc thesis was on the Applications of Nanotechnology in Flow assurance. Her BEng from Igbinedion University Okada, Nigeria is also in Petroleum Engineering. She investigated of the suitability of OKADA clay as possible drilling mud material for her undergraduate final year project. Oluwaseun has worked as a research assistant with the Nigerian National Petroleum Corporation (NNPC), as well as a Safety and Loss Prevention Incident Management team member with ExxonMobil QIT Nigeria among other industrial experiences.